Subsidiary of CEC Entertainment, Inc.
Chuck E. Cheese's (formerly known as Chuck E. Cheese's Pizza Time Theatre, and Chuck E. Cheese's Pizza) is a chain of American family entertainment centers and restaurants. The chain is the primary brand of CEC Entertainment, Inc. and is headquartered in Irving, Texas. The establishment serves pizza and other menu items, complemented by arcade games, amusement rides, and animatronic displays as a focus of family entertainment. The brand derives its name from its main animatronic character and mascot Chuck E. Cheese, a comedic mouse who sings and interacts with guests. Two children in the Ticket Blaster. This is used whenever a child has a birthday party. The birthday child collects as many tickets as they can before time expires. A girl playing in the SkyTubes play area. 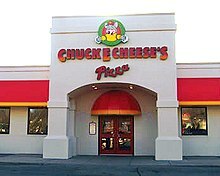 An older Chuck E. Cheese's facility under the now defunct title of "Chuck E Cheese's Pizza"
In the early 1980s, the restaurant franchise debuted in Australia under the name Charlie Cheese's Pizza Playhouse. The name change had to do with the common meaning of the word "chuck", which in Australia is a reference to the phrase "to throw up". Pizza Time Theatre, Inc. also opened at least one restaurant in Hong Kong, which closed shortly thereafter as a result of the initial company's 1984 bankruptcy. A franchise store was opened in a suburb of Paris, France at the time Pizza Time Theatre, Inc. filed for bankruptcy. In 2019, the corporation announced it would go public on the New York Stock Exchange through a shell company, Leo Holdings Corporation, in which Apollo will still own 51% of. Bloomberg also reported that after going public, Chuck E. Cheese would no longer have animatronic animals as part of the entertainment. A 2001 Chuck E. Cheese token. Chuck E. Cheese walkaround character performing in 2017. ^ a b "CEC Entertainment, Inc. Reports Financial Results for the 2017 First Quarter" (Press release). PR Newswire. 2017-05-08. Retrieved 2017-05-31. ^ Ruggless, Ron (Apr 8, 2019). "Chuck E. Cheese's plans merger, public trading". Nation's Restaurant News. Retrieved Apr 9, 2019. Wikimedia Commons has media related to Chuck E. Cheeses.